Oren Blitzbau crossing the finish line. August 19, 2018: When Oren Blitzblau crossed the finish line of the Iron Man competition in Sweden on this Sunday morning, he not only triumphed over the difficult course but also defeated the terrorist who tried to kill him 13 years ago. Blitzblau, an Israeli, was the only blind participant among 1,700 contestants. He came in 83rd place in his age group. 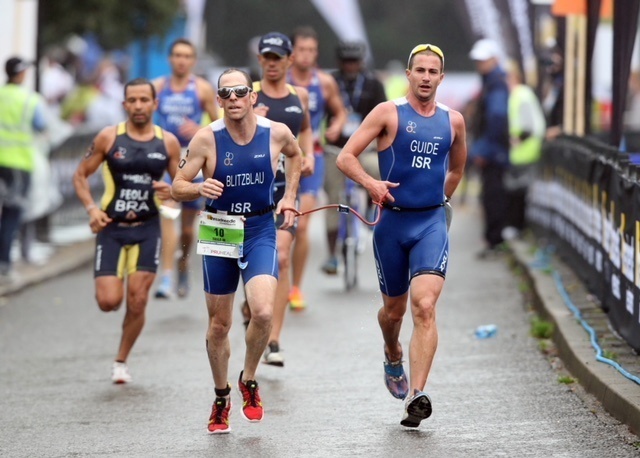 He completed the Iron Man’s 3.8 km (2.4 miles) swimming, 180 km biking (112 miles), and 42.1 km running (2.4 miles), with his running companion, Erez Falk, in 10 hours and 51 minutes. 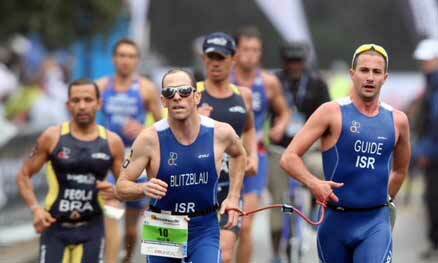 This broke the previous record set by a blind person in the competition by 12 minutes. Sports has always played a major role in his life. As a child in Herzliya, he used to swim competitively, but his swimming career was interrupted when he entered the army, where he served in the Paratroopers Brigade. A few years later he transferred to the Intelligence Corps, where he served … as the intelligence officer of the southern brigade in the Armored Corps near Gaza. In January 2005, during the arrest of terror suspects, a suicide bomber detonated a bomb in an outpost in the Gaza Strip wounding Blitzblau. At the age of 29, he suffered severe damage to the internal organs, burns all over his body, impaired hearing and loss of vision. Blitzblau comes to Beit Halochem to train and work out. 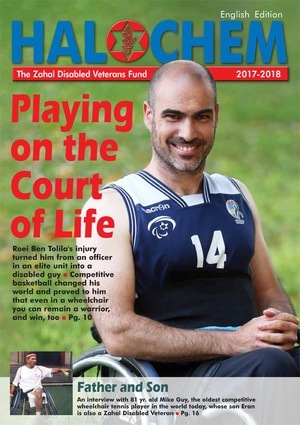 His athletic prowess has been supported by sports scholarship donations, and his expenses for training, overseas competitions, coaches, and necessary equipment have been funded by the Zahal Disabled Veterans Organization/ZDVO. After the rehabilitation process, he began to increase his involvement in sports. In 2013 he was named the European Champion in the Para Triathlon, where he competed in the category of blind persons, which included including swimming (750 meters/ ½ mile), cycling (20 km/12.5 miles) and running (5 km/3.1 miles), finishing ranked 5th in the world. Blitzblau is married. the father of two daughters, and lives in Herzliya. Now, after half a year of exhausting training for competition, all Blitzblau wants to do is relax with his wife Nitzan, who accompanied him to Sweden.